One of the other exciting musicians on the New York scene in the last few years has been Taylor Ho Bynum. 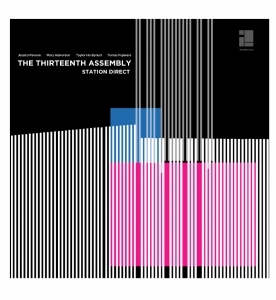 One of his many groups, The Thirteenth Assembly, released its second album, Station Direct in 2011. Built around the numerous influences of each musician, Station Direct spans rock, avant garde, folk and classical with ease. The mixture is subtle yet you will be amazing at the delivery and impact the music will have after a number of spins. "Nosedive" opens with in an almost Americana fashion. With Pavone's viola roaming and sounding casual but calculating. Then the contrasting harmonics of Bynum, Fujiwara begin to slice notes in sections. Halvorson arrives in later stages and brings a cohesiveness to the piece that also allows the musicians to experiment more with sound. "Coming Up" features some intriguing passages between Halvorson and Fujiwara. But it really is a feature piece for Fujiwara who explodes across the kit with exciting and fun. The song was written by Pavone, but she does lay in the background and allows the rest of member to explore and expand the piece beautiful. "Long Road" swirls with experimentation thanks to Halvorson and Pavone. Notes and patterns that move in and out of darkness. Halvorson has a number low toned chords that give way to the pitch of Pavone's viola. As the tune moves forward it shifts from experiment to funky to folk and back to experiment; with Bynum returning in low hues and echoes of a New Orleans celebration and finally a joyous and raucous conclusion. Station Direct is an album that travels in many directions thanks to the influences of its members. But it is an exciting journey and well laid out. 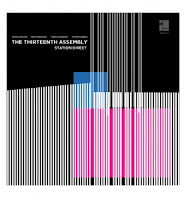 The Thirteenth Assembly is one of those experience and creative side projects that is always worth diving into. You never know what will be next. But you know you're going to love it. Great stuff. I like this blog, since I always find little gems like The Thirteenth Assembly. Another one for my bus ride to work.